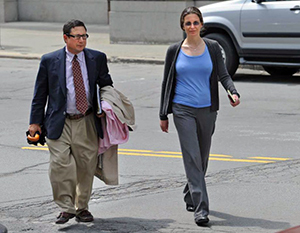 Clare Bronfman with her attorney William Savino. Savino drew up her verified complaint where she swore under oath that she had no written agreement with Parlato, which contradicts entirely the government’s allegation that there was a written agreement. Here is a little game for those who want to be detectives. It will take some deductive reasoning. It concerns the federal case against Frank Parlato and a contract the US Government claims was entered into by Parlato and Clare and Sara Bronfman, Seagram heirs, alleged serial litigators, and alleged cult members. AUSA Anthony Bruce [retired] claims that a contract, called a Letter of Intent, dated Jan. 2008. is enforceable writing to Parlato. The Letter of Intent, the government alleges, governs an alleged $1 million loan made by the Bronfmans to Parlato. Based on Parlato’s failure to comport with the terms of the Letter of Intent, he allegedly defrauded the Bronfmans. Parlato says there is no contract. So is there an enforceable contract? The government’s whole case depends on the Letter of Intent being enforceable. This week, Magistrate Judge Jeremiah McCarthy denied Parlato’s motion to dismiss because it is a question of fact for a jury to decide whether the Letter of Intent is or is not an enforceable contract. Parlato claims that there is prosecutorial misconduct committed by Bruce which justifies possible dismissal since he believes Bruce never revealed to the grand jury that Clare Bronfman swore in a civil trial before a jury and in a verified complaint in another civil suit that there was no written agreement governing the million dollars, and that she never signed or agreed to the Letter of Intent. That means Clare Bronfman swore under oath that she never agreed to the Letter of Intent which the government claims is an enforceable contract. Clare Bronfman testified in a civil suit in the Superior Court of California, Los Angeles County, Precision Development LLC v. Plyam, [BC384285], on March 28, 2011. Q: Well, let’s go to the language on the million dollars. Is that the language that you agreed to for the million dollars? A: I don’t believe it was. Q: Well, what was the language as to the million dollars? A: That we had agreed to loan [Parlato] a million dollars that he would pay back to us at some point in the future. Q: Now, was your agreement to compensate Mr. Parlato based on providing him 33 and a third percent of the profit of Precision and CAM? A: No. That’s why I said I don’t think we ever signed this agreement. Q: So you didn’t agree to give him a third of the profit? A: From my recollection, no. The Letter of Intent states that Parlato was entitled to 1/3 of the profits. If Bronfman said she didn’t agree to the terms how can Parlato be held to the terms of the contract? Subsequent to Clare Bronfman’s grand jury testimony, which is under seal, Clare and her sister Sara Bronfmans, in a 2012 verified complaint in civil litigation allege they loaned Parlato $1 million without a written agreement. If AUSA Bruce led Clare Bronfman to assert the Letter of Intent had been “entered into” in the grand jury [which is under seal] then she later repudiated that testimony in her April 2, 2012 verified complaint in Bronfman v. Parlato, 143205 (NY. Sup. Ct., Niagara Cty.) she committed perjury. that she did not agree to give Mr. Parlato one third of the profits as specified in the letter of intent. To the extent that these sworn statements of Clare Bronfman contradict Clare Bronfman’s grand jury testimony that the Letter of Intent was a entered into as a contract, then she committed perjury. Parlato claims ASUA Bruce was aware of these sworn statements of Bronfman stating that she never entered into the Letter of Intent. Parlato’s defense team presented them to him prior to the indictment. If this is true, then ASUA Bruce suborned perjury if he had Bronfman testify in the grand jury that she entered into the letter of intent when she swore under oath both before and after that there was no written agreement. Unless of course Bruce will next argue that only Parlato was held to the terms of the contract and that an agreement which the other party repudiated in sworn testimony is binding only on one party. If this does not open the door for a full review of the grand jury minutes what will? The government didn’t know if the Letter of Intent was executed or not as late as Sept. 18, 2015. Y’all should be in the running for a Pulitzer with this investigative reporting!